This simple vegetarian recipe is a quick, healthy fix, and is one of the most commonly known Indian recipes in the west. Tastes best with fresh Rotis or Parathas. 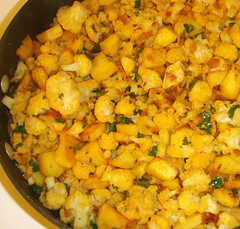 While the Cauliflower boils, in a frying pan, put about 1/2 cup of vegetable oil to heat. Once well heated, fry the potatoes till they are crispy and light golden in color. Hey Sabz! (refrained from calling you Sabzi like i usually do.. can only lead to confusion on an Indian food blog..) i tried this out and it was wonderful! I used aamchur instead of chaat powder though. thanks for sharing! I love aloo gobhi esp with pori or parathas .I have never made your version of the dish but it sounds and luks delicious .. will try it. Poori’s sound yum Sadia! Thanks for checking out OneLifeToEat! Do visit again… there’s lotsa awesome stuff I’ve planned for the next few weeks!